Blackpool Food and Drink Festival was formed by Marie Edwards in consultation with Blackpool Bid in 2016. This was held in St Johns Square, Blackpool within the busy town centre in the November. Marie soon realised that holding a job down and organising such a large event, required more of her time. She needed a system that could reduce the paperwork and admin burden for both herself and her potential busy exhibitors. After chatting with Marie, Event Owl helped her to set up the event page, then directed her around the system so that she could manage her bookings from anywhere at anytime. Exhibitor payment was received straight into her bank account via the system. Marie had a dashboard from which she could easily see all her exhibitors required information which had been asked for. Event Owl interacted on Facebook and Twitter with Blackpool Food Festival, sent out news about the event to its Exhibitor users, and helped Marie fill her stands. From the success of this event, Marie went on to organise a new Spring Festival for 2017, and a food and drink festival within the Blackpool Christmas Light Switch on Festival in November 2017. Both events are taking bookings via Event Owl. "I’ve had the pleasure of working with Event Owl on a couple of events and I found them to be extremely helpful. The staff are always on hand with helpful advice and respond to communications in a timely manner. As an organiser using event owl I have found that it saves time and increases efficiency when dealing with exhibitors paperwork. I would highly recommend them to event organisers and exhibitors." "The system uses technology efficiently and cleverly saving on both time and natural resources". 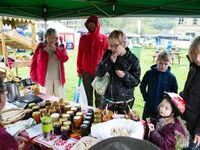 Clitheroe is listed as one of the top Food Festivals in the UK and was Event Owls first sign up, and still use it!